Reviewing Lynsey Hanley’s Estates, and a look back on two housing documentaries. Since starting Skyliner my brain has never really stopped thinking about buildings and cities. My wall is a huge to-do list of post it notes listing places to research, and when I look to my bookshelf to find some respite in a good fiction I'm faced with row after row of books about Manchester, architecture, and all things bricks and mortar. It makes sense that readers interested in my blog might share my same interest in books, and that brings me to a new regular series to the blog, the book club. My intention is to review what I've been reading but for "review" please read "babble on about and go on tangents barely related to the book". But hey, if I'm not ticking off any actual to-dos then I can at least get through my to-reads, right? My book case just breathed a sigh of relief. 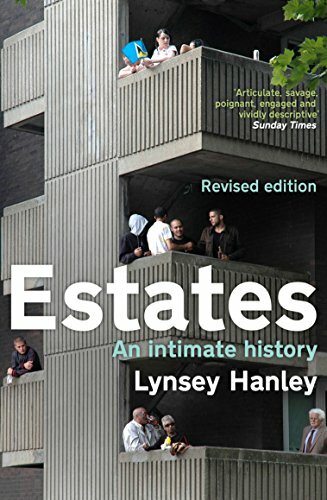 Starting with a firm favourite of mine, and a book that I've recommended to countless others - Estates: An Intimate History by Lynsey Hanley. 'When We Build Again', 1941. One of many reports referenced in Estates. What first stood out to me about Estates was how it was so incredibly tailored to my interests, no matter how niche. Reminiscing about her home on the Woods estate near Birmingham, Hanley cites a wistful line from a song by Smog "the type of memories that turn your bones to glass". This woman is writing the book I could only wish to. Estates is a book about social housing and specifically about Birmingham's Woods estate told through a mix of personal anecdotes and opinions balanced out with engaging facts and figures. Hanley briefly explores how mainland Europeans are content living in apartment blocks whilst the UK are intent on a house and a garden regardless of the expanding population. Heavy emphasis is put upon Hanley's beliefs that the disparity found in society today is down to the homes we live in. She mourns over the infinite loop of inadequate housing and inadequate education that residents of the estates are caught up in. Throughout Estates Hanley touches on the visionaries of housing and planning in the UK, including those who designed garden cities such as Ebeneezer Howard to founders of company towns such as Titus Salt. The book goes on to reference many academic publications that I found myself immediately adding to my book wish list. Hanley's memories are both charming and nostalgic as well as brutally honest. Thinking over the book now I'm reminded of two documentaries - The Tower: A Tale of Two Cities (BBC), and Twelve Views of Kensal House. In the documentary film Twelve Views of Kensal House we are invited to look at Maxwell Fry's modernist London estate through the eyes of life long tenants fifty years after they moved into the property. The film explores the aims of social housing and the changes to mass housing in post war Britain. The Tower was a documentary series by the BBC, filmed over three years on location in Deptford. I'm not even sure gentrification is the right term for what is happening in The Tower. Sure it seems as though there is a social cleansing happening here but it expands no further than the tower block. No efforts are made to pretty the streets for this new wave of yuppies, except for the local pub landlord trying his darndest to cater for the new 'sophisticated drinkers'. What The Tower shows us about estate life is the people it was made for and the uncertainty of their collective future. We meet the lone tenant who has refused to sell his flat to the new developers. A clown no less, unicycling along the empty corridors, juggling in lift shafts, squirting water from his buttonhole at imaginary neighbours. At least that's how I remember it. We watch the gradual ostracism of this desolate man by the cutting off of his electricity and mail service. Finally he has no option but to sell his home for less than half the worth and he vanishes from the story. The series follows the lives of people living in the shadow of The Tower including two drug addicts who are desperate to better themselves but how can they? The series won a BAFTA but vanished into obscurity and to my knowledge has never been repeated. Whilst gentrification is the theme of The Tower for Kensal Houseit's more about issues of mono-tenure mass housing and paternalism. In both documentaries what's inescapable is the looping lifespan of a council estate. Life on the estate starts as a haven, a place where one could live in supposed ideal housing and enjoy an idyllic sense of community but a generation down the line and these dwellings became impoverished and brutal places. Now these estates are on the rise again. We see Kensal House from it's beginnings in the 1930s descend into a bleak monolith by the 1970s and when we catch up with the lifelong residents in the 1980s it seems the flats are on their last breath. But there's a phenomenon amongst architecture wherein what we find ugly and tacky now, in thirty years from now we'll likely see the merit in once again. If a 'dated' building manages to escape demolition it can only hope to quietly bide its time for a few decades and sure enough we'll be fawning over it again. So when Kensal House was dying its death in the late 80s it took until now for us to fall in love with it again and a three bedroom flat in what was an affordable council flat will set you back £4,000 a month. The same can be seen at Alexandra Park estate and Trellick Tower, the latter was a place where people lived in fear of being attacked in the stairwells and is now a pop culture icon with a price tag to match. What Estates offers us that the two documentaries fail to is a way out. Hanley offers suggestions on how to improve social housing in the UK and gives a glimmer of hope that the spiral of poverty and bad housing can be broken.